Just like thousands or even million other zit-faced kids in the 80s, I fell in love whilst listening to this song (and other songs from the same album as "First Love") by Nikka Costa. This song was sent to me by Hary today. As I listened to it, I unashamedly admit that it made me cried a little bit. How vast things changed. How I changed. How being a kid, I believed that unconditional love really exists (I guess I owed it to reading too many books for a kid *LOL*). And how now, as an adult, having been bearing too many heartache to endure, too many rejections, too many compromising, has led me to believe that such thing as Unconditional Love and the likes of it is inexistent. I don't know why I cried.. Is it because the song brings up too many loving childhood memories? "Also it causes all, both small and great, both rich and poor, both free and slave, to be marked on the right hand or the forehead, so that no one can buy or sell who does not have the mark, that is, the name of the beast or the number of his name. This calls for wisdom: let anyone with the understanding calculate the number of the beast, for it is the number of a person. 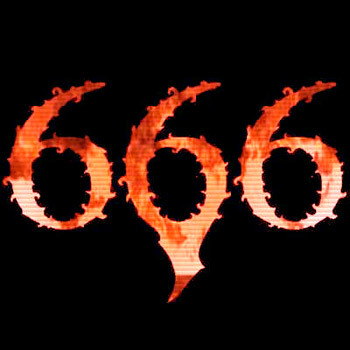 Its number is six hundred and sixty-six"
D'you guys know what date today is? June 6 right? Year 2006, right? You can write it this way : 06.06.06 --> 6.6.6. And.. and.. today is the world premiere of The Omen!